One of early Silicon Valley's less-known but wildly interesting characters was the brother of Thomas Gabriel Hitt (1874-1958), a London pharmacist and chemist who was nearly expelled from Westminster College for creating fireworks, which he kept hidden under his college bed. T.G. 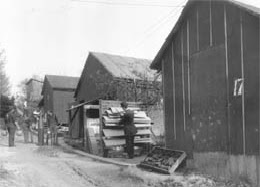 Hitt left England in 1899 and emigrated to Victoria, British Columbia, where he established Hitt Brothers Fireworks Company with his younger brother, Fred G. Hitt, who later became a Monte Sereno native. In 1905 the two brothers moved to Columbia City, Washington, just outside of Seattle, where T.G. bought four acres of rural, wooded hillside. He incorporated his fireworks factory there under the name Strontia and Chemical Manufacturing Company, only to change the name back to Hitt Fireworks Company two years later. At the new hillside factory, T.G. Hitt could test his fireworks and explosions without disturbing neighbors, who came to refer to the site as "Hitt Hill." His brother Fred eventually moved to Monte Sereno, where he was an avid organist, which will have significance later in this story, but more about that later. 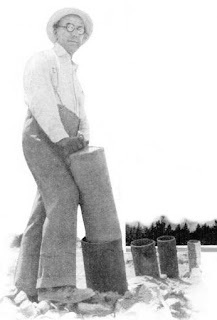 In Monte Sereno, Fred, an engineer by training, specialized on the more practical side of the Hitt brother's business by producing flares for boats, auto owners, and railway engineers. The company also produced flares used to exterminate moles and gophers, as well as a noisy product called "Doggone," which a postal worker could use to discourage hostile dogs. Hitt's bread and butter (in the previously Chinese-dominated fireworks industry) was something called a "Flashcracka," a small, loud firecracker, as well as other smaller firework products like coils of loud caps for cap pistols, crystals which could be thrown into a fire to create a rainbow of colors, Roman candles, sparklers, black snakes, and other affordable novelties. The Hitt brothers substituted photographic black powder (an oxidizer plus magnesium or aluminum powder) for the potassium nitrate which had been used by Chinese fireworks manufacturers. 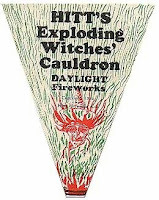 This change made Hitt's firecrackers louder and more startling than the products of their Chinese predecessors, and allowed the Hitts to further stun and amaze during their pyrotechnic displays. Over time Hitt shared his formula with Chinese manufacturers, who then started mass-producing Flashcrackas for the Hitts. W.E. 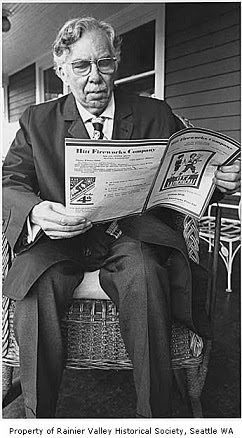 Priestly, Hitt's cousin, began selling Hitt's fireworks internationally with great success. In Seattle, T.G. Hitt and his son, Raymond (shown to the left), were known for creating elaborate sets and recreating famous historical events. Their productions involved extreme and explosive pyrotechnical displays using life-sized, painted replicas of city scenes, plus performances by chorus girls and military drill teams. The grand finale of each event was the conflagration of the entire set, most notably in their more famous recreations of the Fall of Babylon, the Last Days of Pompeii, and the Great Fire of 1889 (Seattle). Notably, Hitt Fireworks also created products for the military during World War II. Those products included parachute flares for soldiers, allowing them to see the ground before landing, plus large-scale smoke bombs to hide military bases and shipyards during the war. My favorite story, however, most likely because it is a local one and it involves a truly over-the-top idea by the National Park Service, concerns Monte Sereno pipe organ-playing engineer and resident, Fred G. Hitt. First, some background. Ray Lyman Wilbur was born in Boone County Iowa and was the brother of Curtis Dwight Wilbur, who became United States Secretary of the Navy under President Calvin Coolidge. While a freshman at Stanford University, Ray Wilbur met fellow student Herbert Hoover, who at the time was working for a local laundry and trying to encourage students to become regular customers. Hoover's wife was a college friend of Marguerite May Blake, who became Wilbur's wife, and the two couples remained lifelong friends. Wilbur retained a lifelong interest in the welfare of Native Americans. He reorganized the Bureau of Indian Affairs to improve Native American prospects and living conditions. 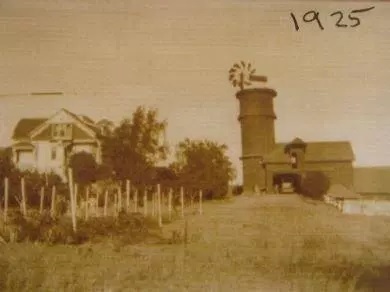 In 1927 when the California State Park Commission was established by the State Legislature, Ray Wilbur, who was a Bohemian Club, Pacific Union Club, and Commonwealth Club member, was appointed to serve with three other commissioners. Because of Mt. Lassen's ties with the Atsugewi, Yana, Yahi, and Maidu tribes, it may have been a site of particular interest for Wilbur when it was finally protected by Congress in 1916 as the fifteenth national park, after a series of volcanic eruptions in 1914 and 1915. To celebrate the grand opening of the new park in 1931, after roads were finally constructed making the park accessible to the public, something spectacular was needed after Wilbur, as Secretary of the Interior, addressed national and state dignitaries. 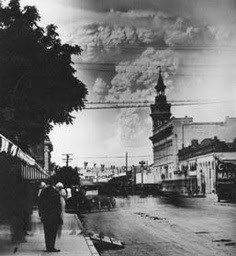 Monte Sereno resident Fred Hitt was hired to simulate the 1915 volcanic eruption of Mt. Lassen, using fireworks, shells, and TNT, with the help of park service workers and an elaborate series of electric signals. "Using tons of powder and chemicals, carried on the backs of mules to an elevation of more than 10,000 feet, a score or more of pyrotechnic experts, wearing gas masks will attempt to duplicate the 1914 eruption of Lassen Peak, July 25. The park, containing 163 square miles and surrounding the only semi-active volcano in the continental United States, was created by Congress in 1916, but has heretofore been inaccessible to the public. A new highway into the heart of the park has just been completed." "Twelve-pound rockets and 38-inch shells will be employed. Each shell is designed to make 500 lightning flashes, with thunder clashes such as accompany each electric discharge during a natural storm. The red lava overflow from the crater will be simulated by specially devised flares and powder flashes. Fred G. Hitt, the expert in charge of the display, believes...(the effect will have) a fair measure of success. " "Much of the firing will be done by electric currents, transmitted by wire from a sufficient distance to give the director in charge (Fred Hitt) a perspective of the entire display. The men in the thick smoke of the crater will place and discharge the huge shells, bombs, and rockets in accordance with a carefully arranged schedule and specific instructions received over the signal wires. To create the lurid glow of a volcano in action, rockets that burn brilliantly for 40 minutes will be set off, 50 at a time, at frequent intervals. To effect the lava glow alone, 1,000 pounds of flares will be ignited." "Governor Rolph and I were on the program in the early afternoon of the second day---just before the fireworks began. These took the form, at 4:00 P.M., of a 'reproduction of typical daylight eruption of Mt. 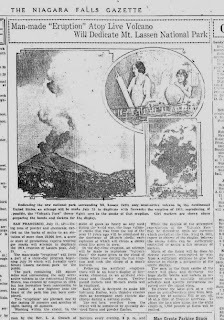 Lassen,' and, at 8:00 P.M., a 'gigantic pyrotechnic display from the top of Mt. Lassen'---both of which events we (along with thousands of other Californians) viewed from Kings Creek Meadows....their artificial, man-made 'eruption' turned out to be even more spectacular than some of Mt. Lassen's own have been. Clouds of smoke rose from the crater, which was ringed with red fire. At night the peak sparkled with aerial flares, bombs and rockets, and the final phase of the fireworks display simulated a molten lava flow, with wave after wave of red fire rolling over the crater's rim and down the bare rocky slopes." It seems that Fred Hitt not only played the pipe organ masterfully, but tinkered with and repaired pipe organs over the years. 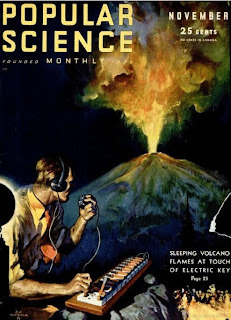 As a result, it's not surprising to learn that Hitt used an old pipe organ keyboard to detonate the simulated Mt. 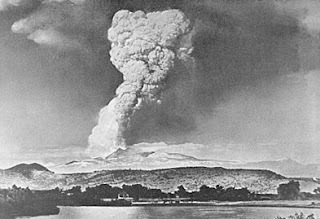 Lassen eruptions and send signals to the gas-masked men in Lassen's volcanic crater, telling them when to discharge their rockets, shells, and bombs, during what was most likely, the most unusual event in California and National Park Service history. More information on opening ceremonies at Mt. 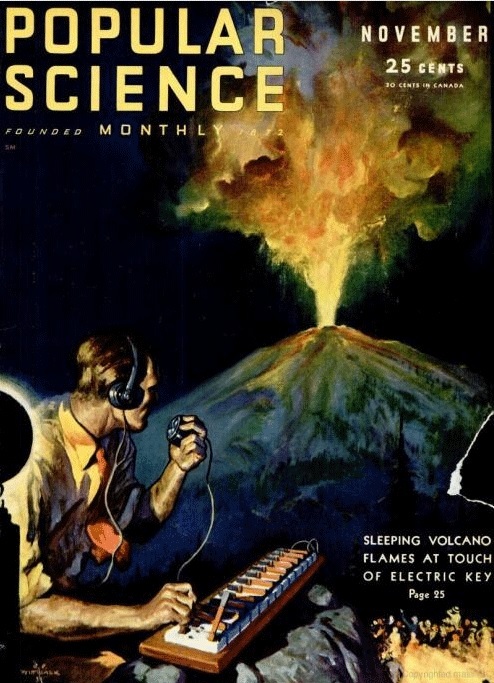 Lassen Volcanic National Park can be found in the November 1931 issue of Popular Science. Some issues can be found online through Google Books. The Memoirs of Ray Lyman Wilbur: 1875-1949 , Stanford University Press, 1960, can be found online through Google Books. The 1931 San Francisco AP article on the dedication ceremonies at Mt. Lassen Volcanic National Park can be found in online newspaper image records for the Niagra Falls Gazette (pictured) and The Reading Eagle. I believe the image of Fred Hitt was taken from an earlier NPS Museum Gazette article, but it could also have been taken from the Popular Science Magazine article of 1931. I have searched online for provenance but only find it reproduced without clear attribution. There is a 1931 NPS publication which covers the re-creation of the Mt. Lassen eruption and fireworks event at the park's dedication, but it seems to have disappeared from online sources. More images of the eruption of Mt. Lassen in 1914 and 1915 can be found online through the National Park Service and USGS Web sites. Heartfelt thanks to Cupertino Historical Society and Rotarian, DougMcNeil, for his slide-talk on Monte Sereno history, with a hope that more about that lovely town and it's notable figures will be preserved and placed online by a future Monte Sereno historical group. The Reading Eagle of Sunday July 19, 1931, also carried a story on the Mt. Lassen event, which can be found at this link in Google News. All material was accessed online, July 1, 2013.